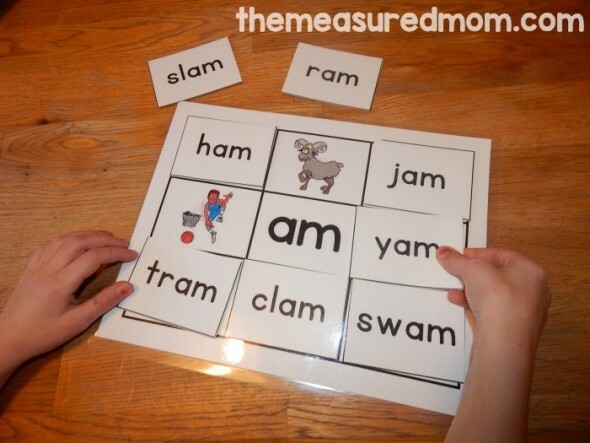 Looking for an activity to help your child practice reading those short vowel words? Try these! Our middle son just turned five and recently mastered short vowel words. These reading mats have been a big help! 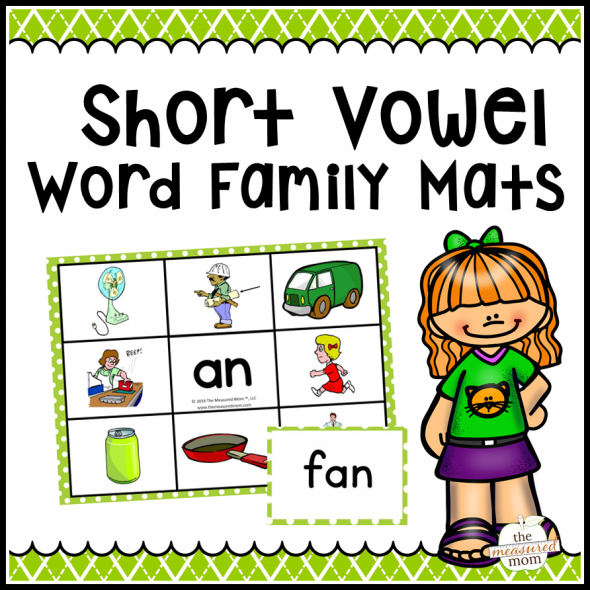 During my first year of blogging, I shared a total of 35 picture and word mats for the short vowel word families. 1. They highlight common word families. It’s much easier to learn to read short vowel words in two chunks (/h/ and /am/) than sounding out every single letter. 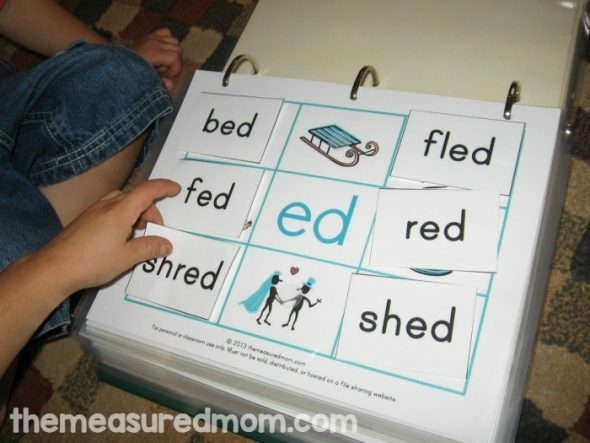 These mats helped my kids learn to recognize familiar patterns in words. 2. They build vocabulary. Most of the mats have a couple of words that are probably new to your child. 3. The pictures give an extra clue for beginning readers. The last thing I want is for my kids to get frustrated when they’re learning to read. The visual aid of the pictures gives beginning readers just the help they need. 4. They’re quick. 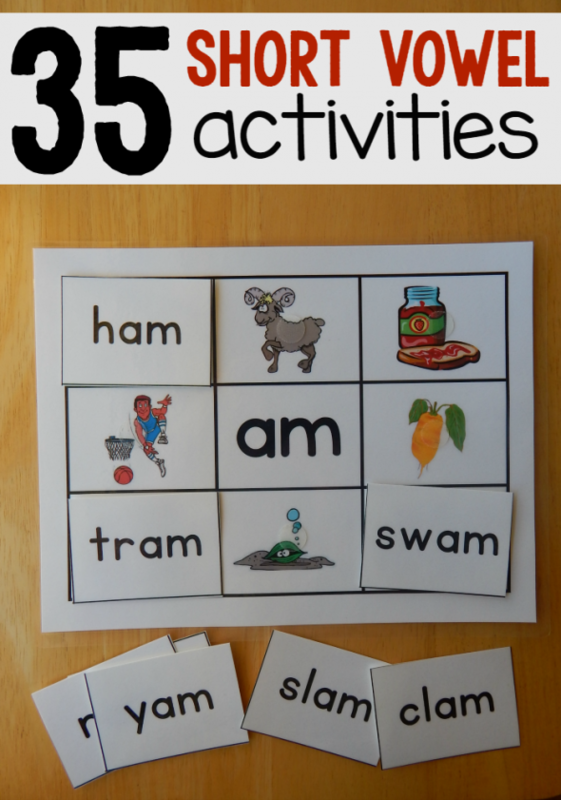 I love reading activities that provide a lot of practice in a short amount of time. While I taught my oldest two kids to read before kindergarten, our reading practice was only about 10-15 minutes at a time. Your child can read a single mat in just a few minutes. 5. They introduce blends and digraphs. Blends (tr, cl, sw, etc.) and digraphs (sh, ch, th) can be tricky for new readers. I’ve found that by introducing them in these mats, my kids master them more quickly than they would otherwise. 1. 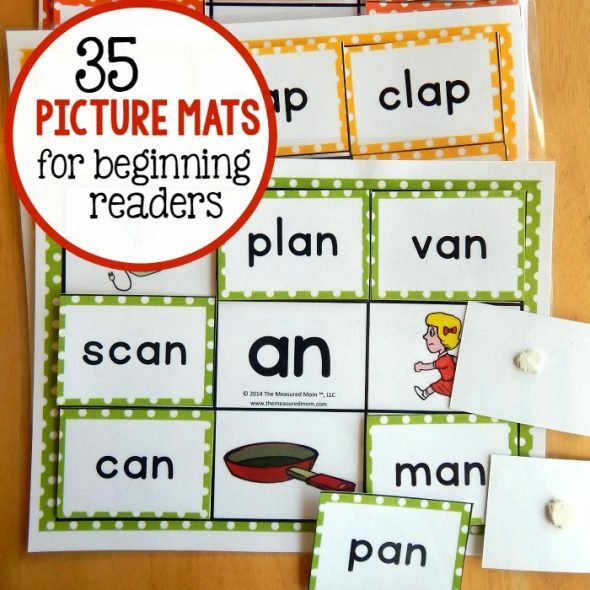 Print the picture mat and the word cards. 3. It’s up to you how you want your reader to attach the cards to the mats. Velcro dots are fun and add a little zip to the activity. They’re also a little pricy and time-consuming to assemble. But they last a long time! You can store the mats in a binder, and the word cards usually stay stuck to the mats. Recently I started using sticky tack. The cards stick very well for the most part, and you can either leave them stuck to the mats or take off the sticky tack each time. You could also use nothing at all and simply have your child place the cards on the mats. In that case, you need a storage solution for the cards. 4. Store the mats. I’ve found that a big 3-ring binder works great! You can also slide a few mats into a gallon size plastic bag and stand it upright in a bin (the bag won’t seal). No tedious downloading! Just one purchase and you’ll get three files in your e-mail to download and save to your computer. Open and print any time! Beautiful new pictures and a crisper font. If you’d like to see the new look, check out the short a mats. I uploaded those into the post. The rest of the mats have the old pictures and font. Color-coded cards. If a card comes loose, you can quickly find the mat it belongs to. And if you don’t want to attach the cards at all, you can put them in individual sandwich bags and easily find which picture mat they belong to. You can get them in my shop! © 2015 – 2017, Anna G. All rights reserved. I am Jyothi from India. 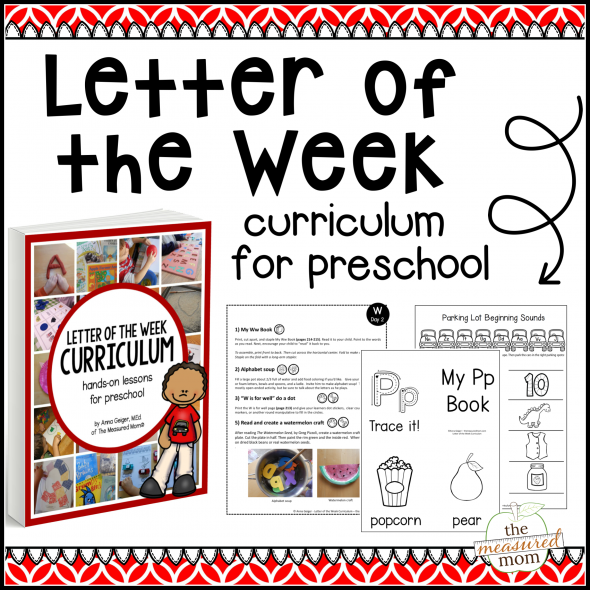 i am love with your blog helps my 4 year old daughter to read and write with your beautiful activity worksheet / articles and your free printables. Thank you so much for your comment, Jyothi! I’m so pleased that you’re finding things to help your daughter learn to read. It’s such a joy to teach our children and watch them learn! 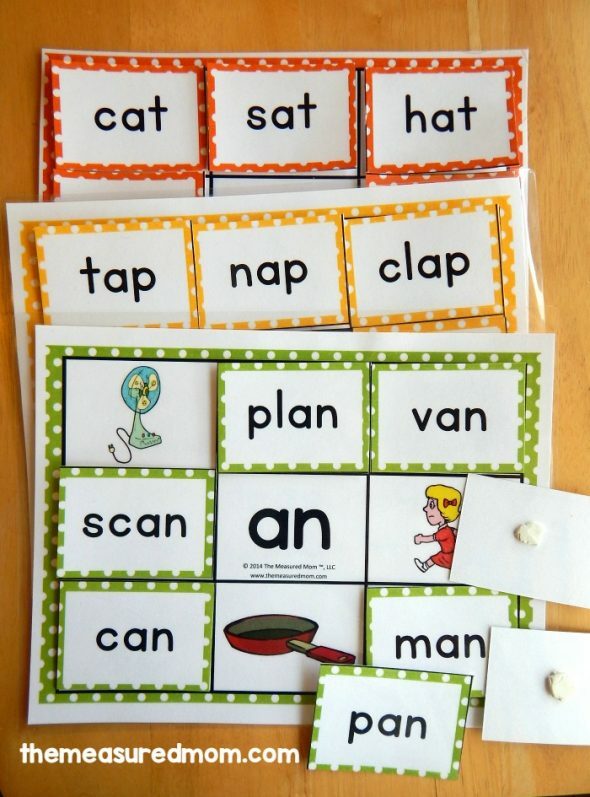 i wanted to ask my DD will be starting kindergarten this year and she can read very few words not all of her pre-primer sight words yet i don’t want her to stay behind when she starts kinder …can you please guide me as to how and where to start using the resources on your site? Thanks so much for this awesome activity, Anna! I can’t wait to use it as part of my Grade 1 Daily Five activities. I added numbers in pencil to each picture on the picture mat, and the corresponding number on the proper word card, but in invisible ink only seen with a UV blacklight flashlight. That way the student has a fun way to independently check his answers at the end. I’ll let you know how it works out! What a brilliant idea – I’ve never heard of that! If you have a link as to where you got the invisible ink and flashlight, I’d love to look into it myself. I got the invisible ink pens from Amazon. Search for “invisible ink pen” and they have ones that have a small UV bulb built into the pen cover. I think they are made by Dazzling Toys. I made the short a picture mats and cards in different colors of hard cardboard paper but found that the ink works best on lighter colored paper (white, light blue, light green) and not on darker colors like orange, green or red). The pens also make a great student reward, as what child doesn’t like to write secret messages to his/her friends! Thanks again for all that you do to get our students on the path to being better readers! Hi Anna thank you so much for all your ideas and printables. They are very helpful for my work as a tutor. Great ideas ! Thank you for sharing . You’re very welcome, Rachelra! Thank you so much for the kind words!